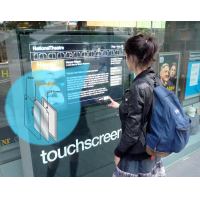 Create a bespoke self service touch screen kiosk with a projected capacitive (PCAP) foil. 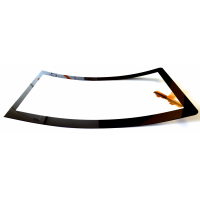 PCAP foils work through toughened glass and function in hot, cold and wet weather. You can provide an engaging touch screen experience in public environments. 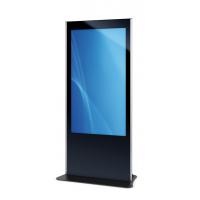 Ideal for ticket machines, wayfinding and retail displays. 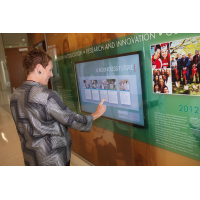 Projected capacitive foil is versatile, robust and precise. 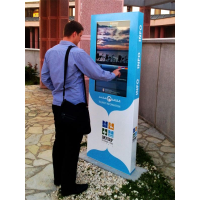 Use it to create a self service touch screen kiosk for any location. 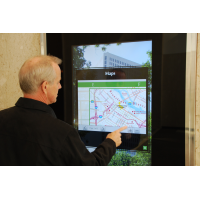 Laminate a PCAP foil to a glass pane and mount the glass in front of an LCD display. 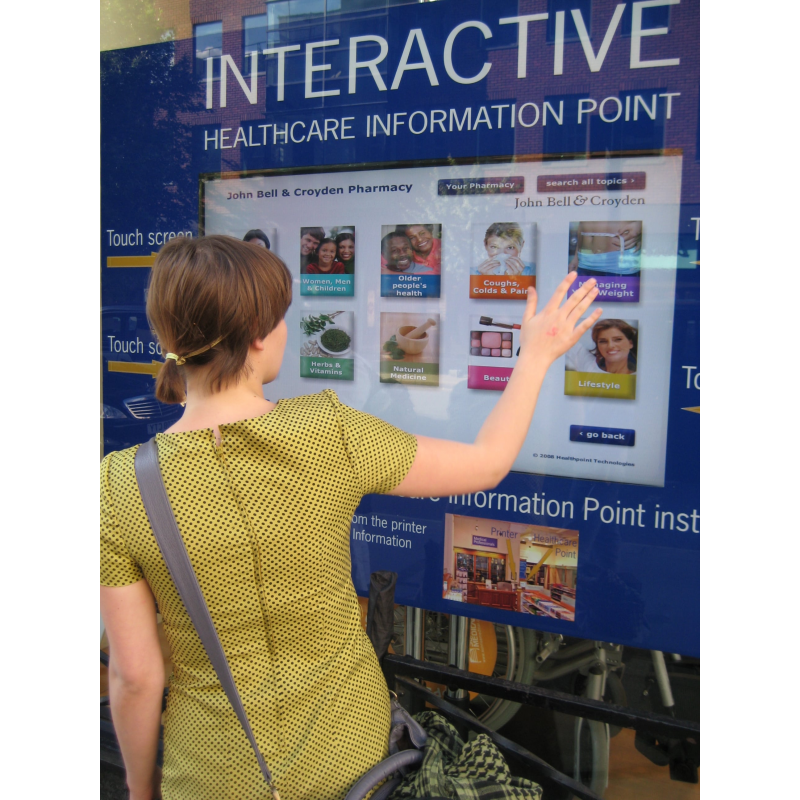 The foil converts the display into an interactive screen. For a completely weatherproof touch screen, use a PCAP foil with an enclosure rated up to IP68. 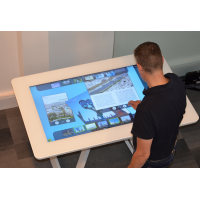 For the most immersive experiences, choose VisualPlanet’s multi-touch TouchfoilTM, which simultaneously responds to 32 touches for multi-user applications. 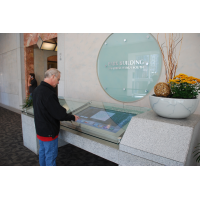 Interactive wayfinding: Provide information in an intuitive format to enhance visitor experience. 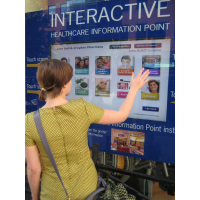 Interactive retail displays: Boost brand awareness, improve customer engagement and generate revenue. 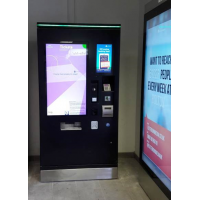 Self-service ticket machines: Provide a 24-hour ticketing service to travellers while saving on staffing costs. 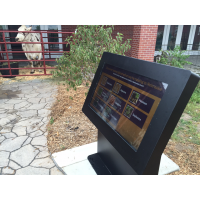 Fast food self-ordering screens: Encourage an increase in average order value and speed up the ordering process. 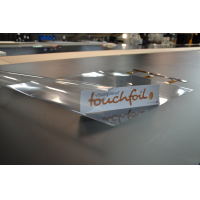 VisualPlanet has over 15 years of experience manufacturing PCAP foils for international brands. 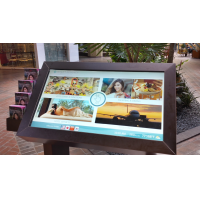 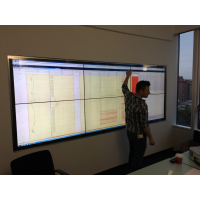 The company works with you to design and create the best touch screen for any environment. 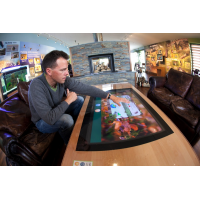 VisualPlanet provides a two-year warranty and excellent customer support. 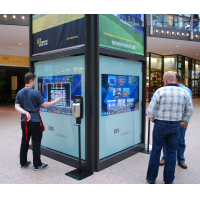 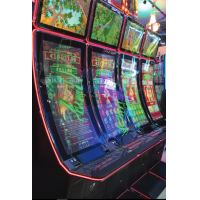 You can have complete confidence in the reliability and longevity of your touch screen kiosk. Reliable: PCAP foils are ideal for reliable touch screens that work day and night without problems. 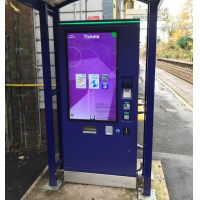 Ideal for providing a constant service in unattended locations. 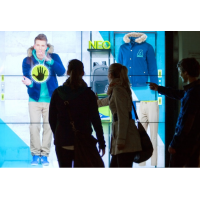 Vandal-proof: VisualPlanet’s PCAP overlays work through glass up to 10 millimetres thick. 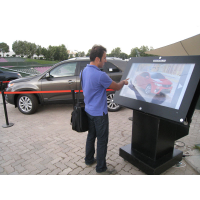 The LCD screen is protected from accidental and deliberate damage. 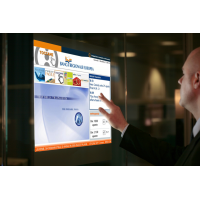 Your self service touch screen kiosk has a long life with reduced downtime, which saves you time and money. 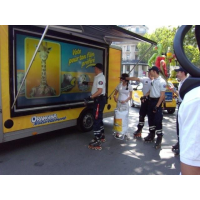 Weatherproof: PCAP foils work in hot, cold and wet weather. 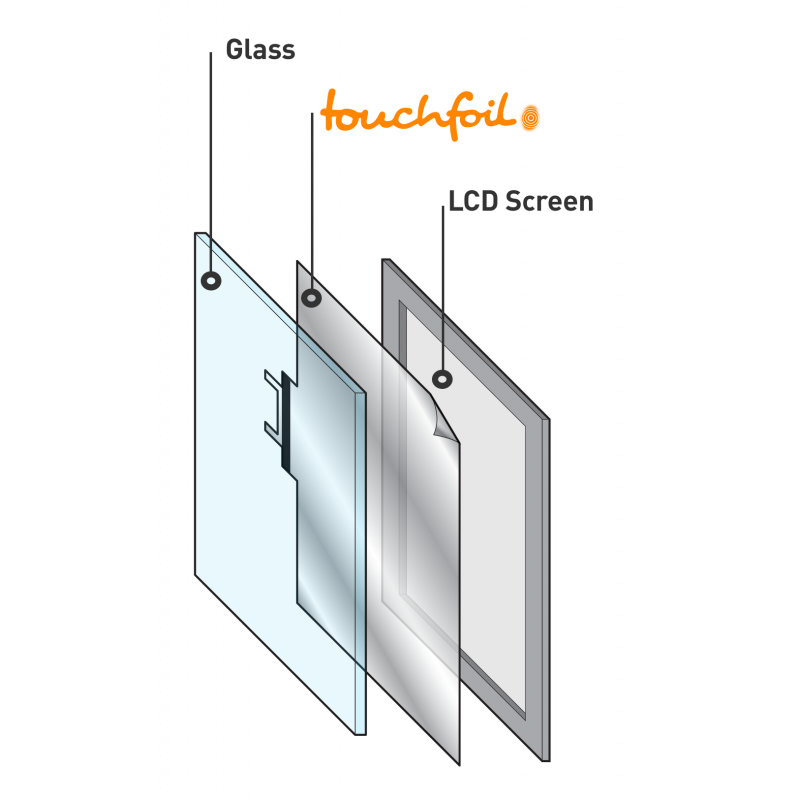 Use PCAP overlays with enclosures rated up to IP68 for complete protection from water, dust and dirt. 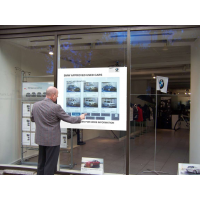 Your display generates revenue in all conditions for maximum return on investment. Bespoke: VisualPlanet’s PCAP foils are available in sizes from 15 to 85 inches. 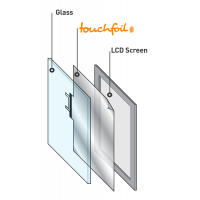 Purchase a PCAP foil individually or applied to glass. 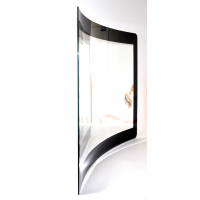 Choose from flat or curved glass to provide the most memorable touch screen experiences. 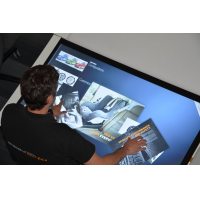 Talk to VisualPlanet to discuss your requirements. 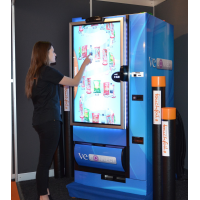 To create your own self service touch screen kiosk, contact VisualPlanet using the form below.